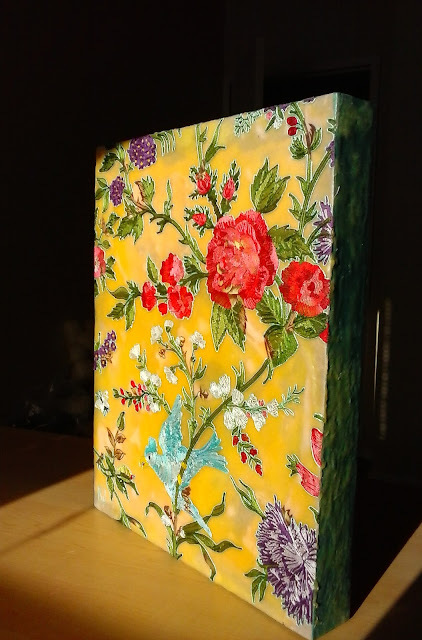 Grandma's Garden, 9" x 12" x 1.5", Embroidery cotton, beeswax, fabric, and acrylic paint on birch panel. Grandma Mitchell loved to laugh. She had a kind heart and seemed to understand that being a kid wasn't easy. After watching me in any kind of event at all, like a school play or public speaking competition, she would shove a tightly rolled up bill into my hand and tell me to buy myself something special. Later, I would unfold the unexpected five or ten dollar bill and wonder at her generosity. Every weekday afternoon, after Grandpa's lunch was cleared away and he was either stretched out napping or headed back out to the barn, Grandma would sit down in her upholstered rocker, turn on her afternoon soaps and reach for whatever needlework was in her work basket at the moment. Often, it was something for one of her grandchildren. One Christmas she gave us all crocheted snow man puppets. For one of my birthdays, she gave me a crocheted fish soap-on-a-rope with an extra fancy Avon soap inside. She also embroidered pillow cases and quilted. She made quilts for every single one of her grandchildren and even a few great grandchildren before she passed away. In my last workshop, I told the group about the tin of embroidery floss. We were talking about the different kinds of materials you could use in 'yarn painting', and I mentioned that I wanted to use Grandma's embroidery threads but didn't think I could do something that fine. I also mentioned that I wanted to try incorporating sections of fabric into the beeswaxed surface. After the workshop, I replayed the conversation on my head, looking at my stash of favourite fabrics and the tin half buried on the shelf. I felt the stirrings of an idea. What if...what if...what if....Eureka! Grandma's Garden is the first product of that epiphantic moment and combines both of the ideas I had been wanting to try. 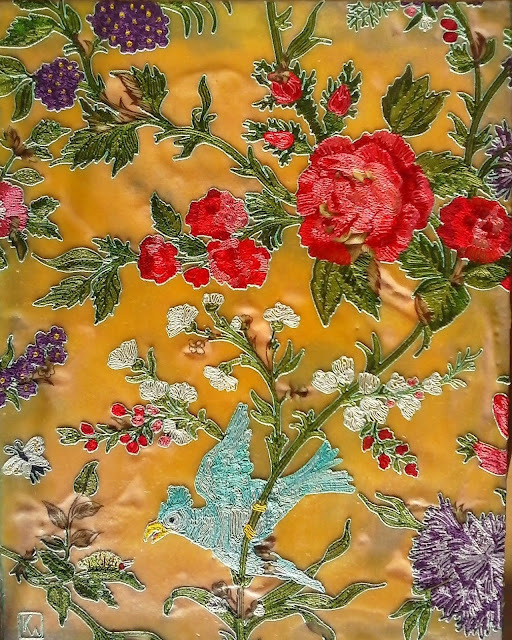 There is a layer of fabric sandwiched between layers of beeswax and I've used Grandma's embroidery cotton to accent and play with the fabric print. The overall effect reminds me of richly embroidered chinoisery textiles. In places, the fabric's design peeks through unaltered. 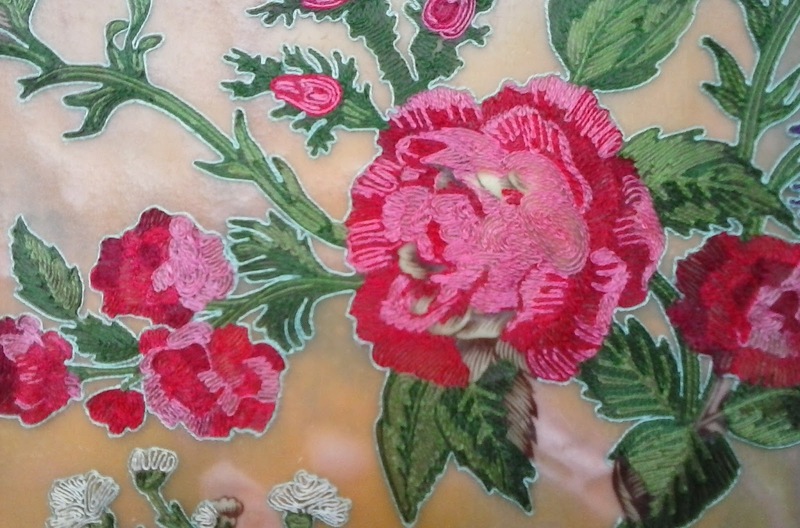 Detail of Grandma's Garden - See the fabric design peeking through the main rose? Unlike my wool pieces, sections of the beeswax surface are left uncovered. There's lots of room for experimentation with this method and I intend to return to it and complete a block of embroidery themed pieces. 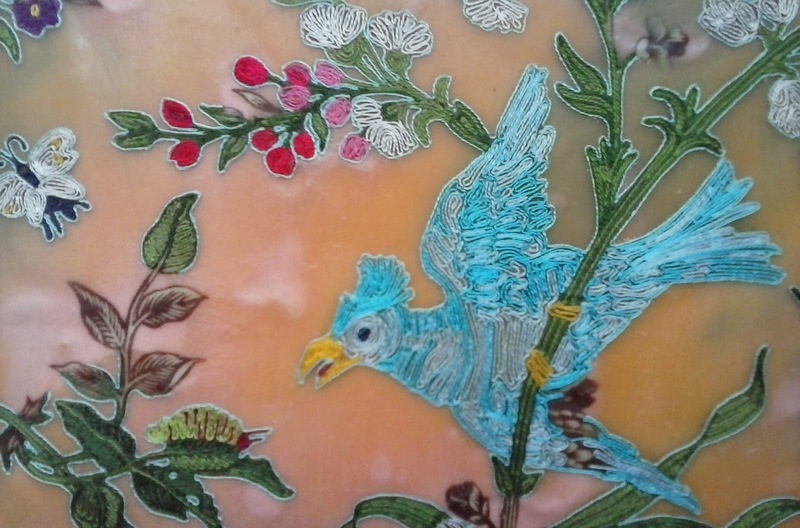 Grandma Mitchell loved pretty things. 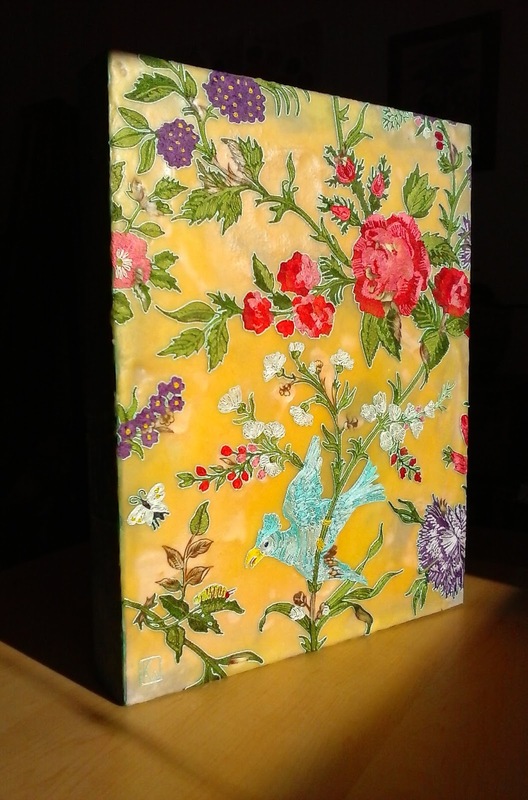 She embroidered birds, butterflies, and flowers with the very same threads I've used in this piece. I think she'd like it. There's a twinge of sadness that comes whenever I see yarns, embroidery flosses, hoops and needles in a second hand store. You just know they were someone's coveted treasures once. I wish I could rescue them all.